Randal Grichuk didn't feel any pressure after signing a five-year contract extension less than 24 hours before Wednesday's game. 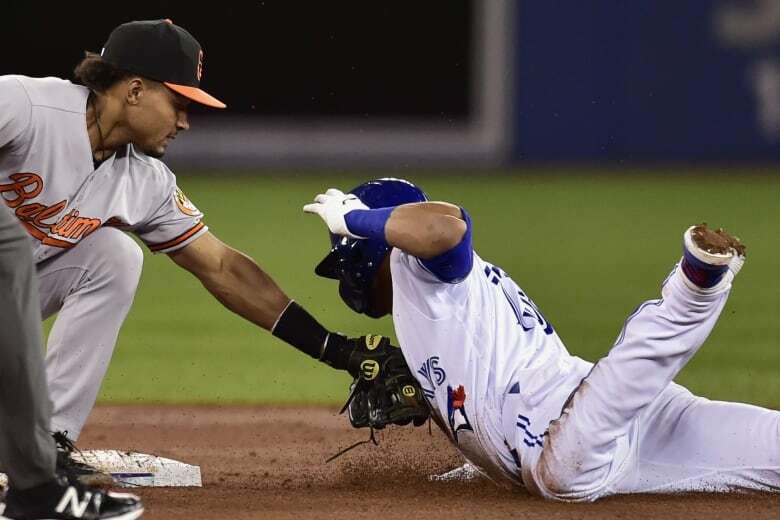 Grichuk hit two homers and a double to back another solid start from Matt Shoemaker, and the Toronto Blue Jays defeated the Baltimore Orioles 5-3 to snap a three-game slide and avoid a sweep at the hands of their division rivals. "Any time a team commits to you like that you want to go out there and reassure them that and made a good deal," Grichuk said after the sixth multi-homer game of his career. "If I went out there and went 0 for 4 it probably wouldn't have changed their minds, they know who I am at this point, but it's definitely satisfying to go out there and have a good game after that." Shoemaker (2-0) tossed seven scoreless innings for a second straight start in a Toronto uniform, allowing two hits, one walk and striking out eight as the Jays (3-4) capped their first home stand of the season with a win. But Baltimore didn't make it easy. Trey Mancini gave the Orioles (4-2) late life with a three-run homer to straightaway centre field off Daniel Hudson in the ninth before closer Ken Giles came in for the final two outs. Grichuk, playing in centre following Tuesday's trade of Kevin Pillar to San Francisco, said he heard a jeer from a fan on the homer. "I actually had one fan on Mancini's home run saying 'Pillar would have caught that,"' Grichuk said with a smile. "So that was definitely nice of him. But it's one of those things where I know I can play centre. ... (I) know that defensively I can make plays and make things happen and trust in my abilities." Lourdes Gurriel Jr., had two hits, including an infield single that he ran out for his first hit of the season. He also drove in a pair of runs as Toronto handed the Orioles (4-2) their first loss in five games. "I felt a little bit of pressure, of course, everybody knows that," Gurriel said through a translator. "But now that I've got my first hit I feel pretty good about it." Manager Charlie Montoyo said the two-hit performance from Gurriel could be enough to get his confidence going. "He feels down right now but you need to be lucky sometimes and he was lucky," he said. "He was 2 for 4 with two RBIs so that's going to get him going, I believe." Nate Karns (0-1) opened the game on a bullpen day for Baltimore, allowing an unearned run and three hits while striking out four over two innings. Grichuk's second homer — and third of the season — landed in the second deck in left field in the eighth inning off a slider from reliever Matt Wotherspoon, who was making his major league debut. Gurriel tacked on two more runs with a double off Wotherspoon to extend the lead to 5-0. 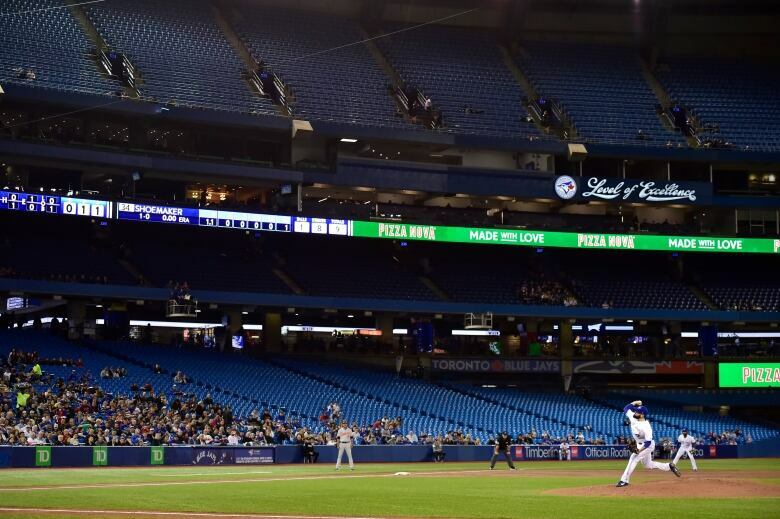 Grichuk had put the Blue Jays up 2-0 in the third inning with his first solo shot, sending a fastball from Jimmy Yacabonis into the left-field seats. The 27-year-old outfielder also doubled in the first inning and came around to score on a throwing error to Orioles third baseman Rio Ruiz that was prompted by a Teoscar Hernandez single. "I think there were two pitches the whole game that were kind of in my head ... (but) a lot of that pressure is taken off by having that extension," Grichuk said. "I'm excited to see what the season can look like."